. 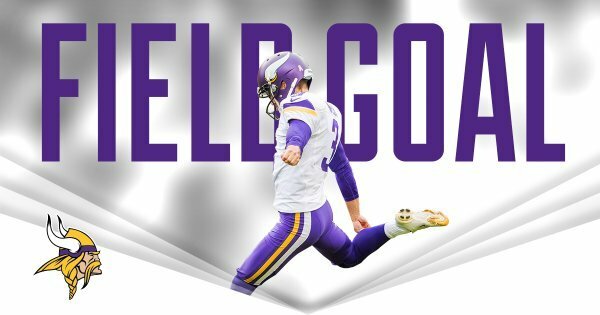 @teddyb_h2o connects with @Jay_wright4 on 3rd down to extend the #Vikings drive. Pass on 3rd-and-2 broken up by Tru Johnson, and Vikings kick a 34-yard field goal to go up 3-0.
.@BlairWalsh3 is now 18-of-20 after hitting a 34-yard FG to give the #Vikings a 3-0 lead. Walsh has now connected on 14 consecutive FGs. Dear Nick Foles: How can you spend a wk working on game-opening play, receiver runs open & you don't look at him? Vikes thank you. #Vikings ' best asset on defense so far today has been Nick Foles. Woof. Rams fans will be sad if their team moves but the relocation of Nick Foles might be worth it. Making your fans watch this guy is cruel.
.@MrInkredibleXII 's first catch of the game moves the #Vikings into STL territory. Three early jumps by #Rams in opening two series.
.@AdrianPeterson with his 90th career rushing TD gives the #Vikings a 10-0 lead with 5:24 to play in the 1st quarter. Adrian Peterson runs it in from six-yards out over the right side for a touchdown. After x point, MIN leads 10-0. 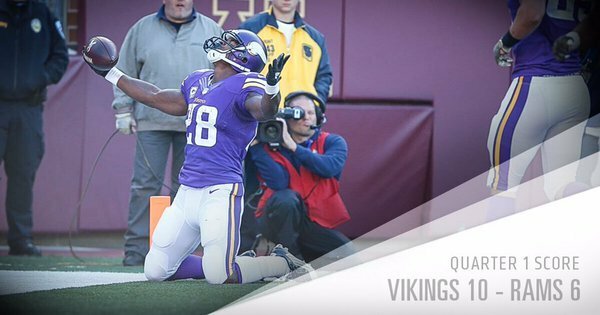 5:24 in Q1.
.@AdrianPeterson now has 95 career total TDs (90 rushing, 5 receiving). The #Vikings now hold a 10-0 lead after the 6-play, 80-yard drive in 3:30. #Vikings ' offense has been mainly heavy sets. Came out in multiple TE looks in 7 of 9 plays that drive. If the Rams offensive game plan continues to rely on Nick Foles in today's game, the Vikings will win 49-0. That 80-yard scoring drive is the 5th scoring drive for the #Vikings of 80+ yards this season. This is the fast start #Vikings needed. They had 16 first-quarter points in seven games. 10 today. Foles to Austin on 3rd-and-6 nets 10 yards and a first down at the STL 34. BOOM! 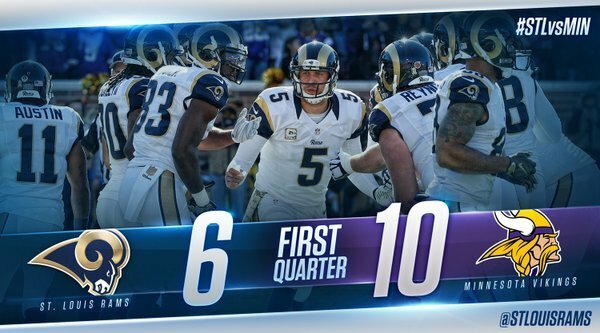 Foles to Britt brings the #Rams offense to life. 55-yard catch puts the offense in the redzone! wish TEDDY could do that! ****. Gurley drags Linval Joseph to the 1-yd line on one play, then on next he bounces off 248-pound Audie Cole to rumble into end zone. #Rams going for 2-point conversion after the Todd Gurley score. #Vikings hold 10-6 lead after failed 2-pt conversion from Jeff Fisher. 10-6 #Vikings lead after they stop the #Rams on their 2-point attempt. Todd Gurley punches it in after the 55-yard @KennyBritt_18 reception. 2pt conversion failed. Norv's "equal-opportunity offense" has resulted in 8 completions to 8 different receivers in the first quarter.